This is an eerie item to find and I would return it if I could because I love Ruffian and also I have had almost the entire collection of Breyer model horses since I was little. Unshockingly I played with the toy horses the way other kids did dolls. I did not have this one though…I looked on the Breyer Website where the Ruffian model is listed as “retired” along with the Clydesdale! That’s terrible; the Clydesdale is awesome. “A Thoroughbred blessed with blazing speed, Ruffian’s brief but brilliant career was marked by triumph and tragedy. In 1972, a nearly black filly with a tiny star was foaled in Kentucky. Bred by Mr. and Mrs. Stuart Janney Jr. of Locust Hill Farm, she was a tough, independent tomboy who was big for a filly (16.2 hands) and unstoppable from the start. 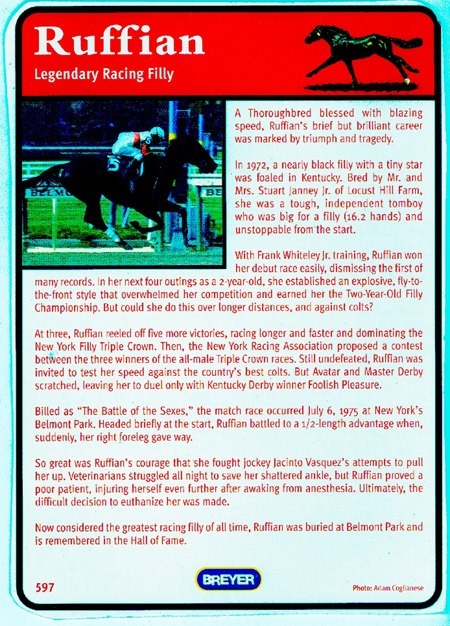 With Frank Whiteley Jr. training, Ruffian won her debut race easily, dismissing the first of many records, in her next four outings. As a 2-year-old, she established an explosive, fly-to-the-front-style that overwhelmed her competition and earned her the Two-Year-Old Filly Championship. But could she do this over longer distances, and against colts? At three, Ruffian reeled off five more victories, racing longer and faster and dominating the New York Filly Triple Crown. Then, the New York Racing Association proposed a contest between the three winners of the all-male Triple Crown races. Still undefeated, Ruffian was invited to test her speed against the country’s best colts. But Avatar and Master Derby scratched, leaving her to duel only with Kentucky Derby Winner Foolish Pleasure. Billed as “The Battle of the Sexes,” the match race occured July 6, 1975 at New York’s Belmont Park. Headed briefly at the start, Ruffian battled to a 1/2-length advantage when, suddenly, her right foreleg gave way. So great was Ruffian’s courage that she fought jockey Jacinto Vasquez’s attempts to pull her up. Veterinarians struggled all night to save her shattered ankle, but Ruffian proved a poor patient, injuring herself even further after awakening from anasthesia. Ultimately, the difficult decision to euthanize her was made.